There is a one way road going up Fraser Hill. Apart from that there is another one way road getting down Fraser Hill. In case you are going to Fraser Hill from Kuala Kubu Baru, you will arrive at the junction going up Fraser Hill. 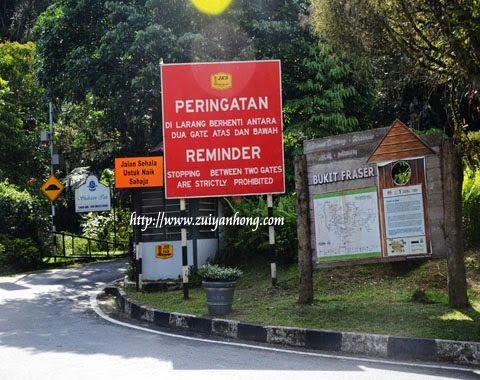 On the other hand if you are traveling from Raub or Bentong, you will reach the junction getting down Fraser Hill. 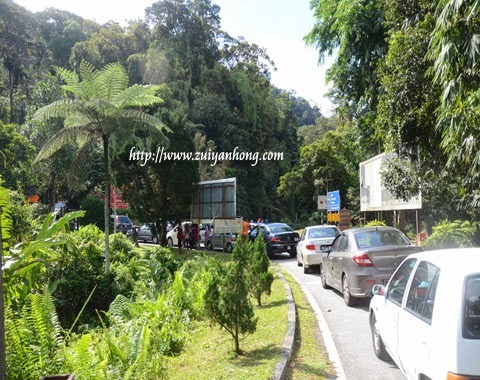 Visitors to Fraser Hill should follow the rule to avoid accident. There were many cars queuing at the junction going up Fraser Hill when we arrived there. We were told that there was an upgrading work ongoing at the road getting down Fraser Hill. I took some photos at the foothill while waiting for the gate to be opened. 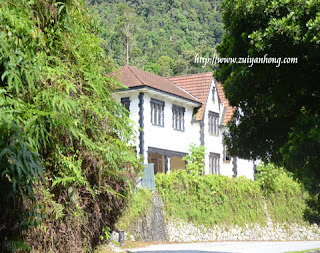 There was only a road going up and getting down Fraser Hill in the past. Vehicles had to take turns going up and getting down. This is the photo of an abandoned rest house. Before that, tourists dropped by the rest house to have food and refreshment while waiting their turns going up Fraser Hill.